The meaning of Eastern Exploits is twofold One: A striking or notable deed, feat or adventure Two: to utilize for profit or take advantage. This blog will encompass both of these definitions as I seek to document my travels throughout Eastern Europe and my research on human trafficking in the former Soviet Union. 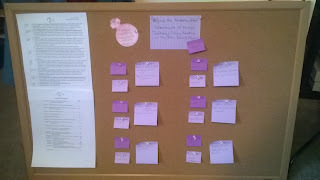 No, this is not a police department's criminal investigation board, this is the outline for the book I am writing based on my dissertation. I am a visual person and mapping out the different chapters to my book along with the main revisions necessary has helped me wade through the lengthy and overwhelming process. 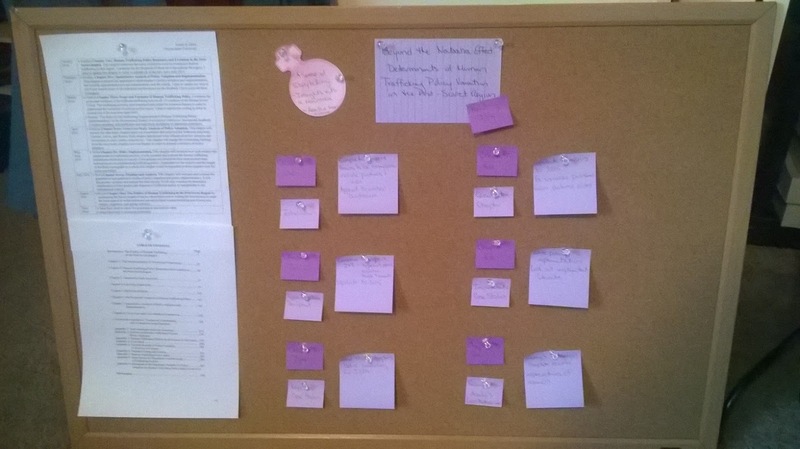 When writing the book seems daunting, I look at the board and break things down into more manageable parts. It helps me see how much I have done and where I am going with the revisions. I know they make computer programs that do that now but I am old school and I enjoy looking this when I need to rework a chapter or change the design of a chapter. I also posted my work plan for the next few months and my table of contents to help me visualize the process. I just started writing the only brand new chapter on policy implementation this week and it is slow going but I know every step is closer to my goal of a finished and published book. The writing and revision process will likely dominate my life this summer while I am in DC as a visiting scholar at the Kennan Institute. Revising is not as glamorous as gathering the data in the field but it is an important part of the scholarly process so I wanted to make sure I documented it in a blog post! just wanting to let you know that I am also checking in on your blog ;-) Impressed by your organization and discipline - good luck with the book project (though it looks like you hardly need it)!! Awesome post!. I really appreciate you to mapping out your dissertation in this way. Writing manuscript is something best plan to enhance the knowledge. This is the great source of learning so visit website and get best chances. I've study these details. I'm extremely fascinated relating to this excellent publish. We additionally reveal an excellent source for the looking at regarding Medical Manuscript Composing http://www.manualwriting.net/our-manual-writing-services/help-with-writing-a-training-manual/. Sometimes you cannot just judge a thing with your manuscripted things and you cannot just put that things down to there. visit website that is very helpful for the academic papers writing. Can you tell us how to map the book with the manuscript. I want to do that for click to click to explore from the book. Waiting for your kind words. Laura! Thanks for posting such a powerful blog! Extremely useful content. Many job-seekers has lost the many opportunities because of the un impressive employment letter and resume. read more for further details. Wao I liked this working strategy.I am also interested to learn about dissertation writing.Share some content about https://www.professionalletterwriting.net/professional-letter-writing-services/ texts and tags implementation.Thank you. Participating in the Red Sand Project at the Center for Civil and Human Rights which invites people to find sidewalk cracks and fill them with red sand to help raise awareness of the vulnerabilities that lead to exploitation and human trafficking! I am an Assistant Professor of Political Science at Millikin University and a Title VIII Summer Research Scholar at the Kennan Institute. I research human trafficking policy adoption and implementation in the former Soviet Union and work actively in the anti-trafficking movement in the United States.